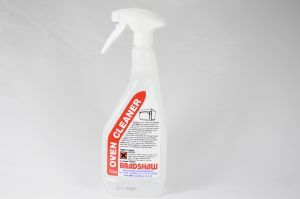 750 ml Oven cleaner, non caustic & kills salmonella + Listeria. Powerful oven cleaner spray for conventional and Rapid Cook ovens. A specially formulated non-caustic cleaning spray for conventional ovens. salmonella, listeria and other related bacteria in 60 seconds. Just spray the oven cleaner on to the surfaces to be cleaned, and allow to soak in for ten minutes. Rinse and wipe the oven clean. Supplied in a 750ml spray bottle.